France is the country for campers. 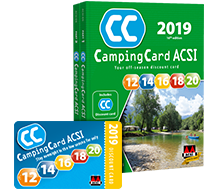 The country offers something for everybody with campsites in the vast countryside, close to the rough mountaintops of the Alps and Pyrenees or along the romantic sandy beaches of the Mediterranean coast. The traditional provincial wines, cheeses and tasty delicacies make a holiday in la douce France a very enjoyable getaway. The hills and mountains lend themselves perfectly for impressive walks or hikes. These may take you along the Grand Canyon of France, the fierce Gorges du Verdon. In the mountains you can find majestic waterfalls, such as in the Drôme. Here, the 72 metre high Chute de la Druise waterfall plummets down at great speeds, a mighty sight. In the Burgundy winemaking area Beaujolais, the Beaujolais Nouveau is presented at the market every third Thursday in November. The grape for this wine has only been picked two months earlier, which results in a fruity wine. A festive and special event for every wine lover. There is also a theme park inspired by the Beaujolais wines, the Hameau Duboeuf. Every campsite in La Douce France has its own unique characteristics for a successful camping holiday. Step out of your caravan in the morning and enjoy a view over the Jugon-des-Lacs lake, or take an inexpensive camping holiday to charming estates of age-old castles, such as the Château de Galinée. 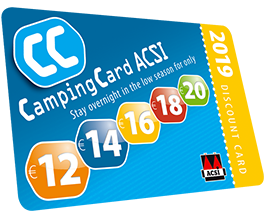 The country offers quiet, small campsites where you can camp at bargain rates in low season with your CampingCard ACSI. The perfect recipe for a relaxing holiday. You can also visit big campsites, which have more extensive facilities. Have an authentic French croissant or baguette from the local baker for breakfast to make your camping trip complete. In total there are about 510 charming castles and imposing forts in France. Each has its own characteristic ambiance. Through the centuries, rulers such as Louis XIV and Napoleon built their own castles in matching, original styles. Visiting these castles, for example the Château des Adhémar, will show you a little bit of French history. It is estimated that there are as many French cheeses in this beautiful country as there are French castles. The most well-known are of course Brie, Roquefort and Camembert, but the Petit Quercy, Gruyère and Emmentaler cheeses are also delicious. Just the thing for when you are back at your tent, mobile home or caravan in the evening! France is a big country with a varying climate. In low season, temperatures vary between 10 degrees Celsius in the north and 20 degrees Celsius in the south. These are fine temperatures for people who like to spend an active holiday walking or cycling. In the Alps and Pyrenees the temperatures will fall to below freezing. This offers possibilities for winter sports and inexpensive winter camping!